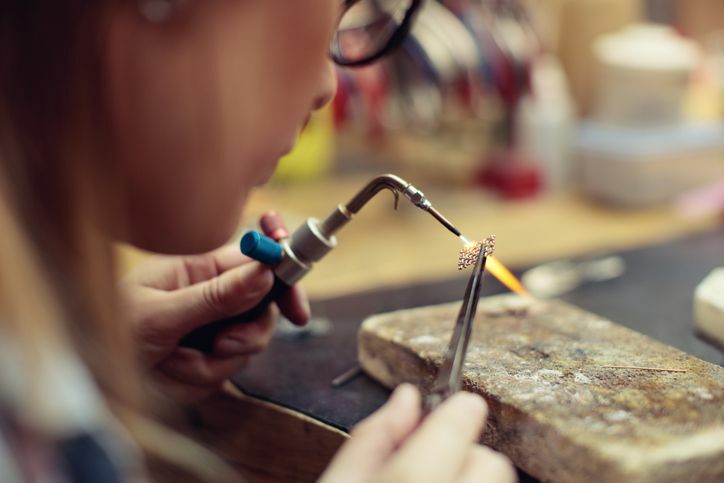 Just about every jewelry maker thinks about trying his or her hand at metalwork, and with that are the questions about the soldering torches, torch tips, fuel, and metal melting-point temperatures. The first time you use a soldering torch might be a scary proposition. The open flame can seem intimidating and may make you feel more like a construction worker than a fine design artisan. Do not let these preconceived notions turn you away from soldering or divert you to use some insufficient equipment. With proper safety and practice, you can become comfortable with the flame. Find out more about why you need to use a flame torch versus a soldering iron. Learn how to pick the correct fuel for your torch and about other resources that can help you learn to make metal jewelry. Why can't you use a soldering gun, soldering iron, or cold-heat soldering device rather than a torch with a flame when soldering jewelry? Soldering requires that you melt bits of metal onto metal. If you cannot melt the metal, you will not be successful. Most soldering guns and irons are used for soldering electrical wires together, which requires less heat. Those tools simply do not get hot enough to melt larger jewelry metals. The melting point of sterling silver is 1640 F or 893 C. Copper melts at 1981 F or 1083 C. Gold has a melting point of 1945 F or 1063 C.
The type of fuel you use is also an important element to consider when you select the proper type of torch to solder jewelry. A jewelry torch is fueled by clean fuels such as butane, propane, mapp gas, or a mixture of propane and oxygen. If you are just starting out, get a small propane tank at your local hardware store. Then, purchase a torch tip or head. These are available at most jewelry supply companies, such as Rio Grande, and can be easily attached to the top of your tank. You just screw them on. Examples are the basic torch tip or a pencil torch tip. Rio Grande makes a Benzomatic tip for about $50. The Benzomatic Pencil Torch is perfect for those who may be afraid of the flame or are using a torch to solder for the first time and want to try an economical option. The torch features a fine tip with an adjustable flame control knob for precision. The self-ignition feature makes it easy to turn on and it has an auto-stop safety feature. Before you start to work, make sure you are working in a clean, well-ventilated location. Take any items that might be flammable out of the area where you are working. If it’s not possible to remove a flammable item, be sure to use a heat shield to protect it from the heat of your soldering torch. Use a good overhead light to shine over your workspace. Make sure you use gloves, goggles, and an apron. Learn more about the elements of learning to solder, working with metal, and making jewelry with local classes in your area, basic information on metalsmithing, and this step-by-step soldering guide.